Meet an Aussie Rc Fishing Boat Expert! Since 2008 “gleno2008” (his YouTube handle) has Entertained us with his Awesome Homemade Remote Control Boats For Fishing! A combination of skills, imagination, and know-how is why we’ve dubbed Gleno2008 our Rc Fishing Man of the month! He has a real knack for assembling the most extreme of all Rc fishing boats, then sharing his gripping adventures with us on YouTube for years. With cam onboard capturing every moment of his epic battles between rc boat and fish he has managed to amass over 500,00 views on his YouTube channel Mean Machines. Upon closer inspection of this spectacular rc fishing machine we notice how for one he enhanced his rc boat to give it more stability. After all he likes going after big fish, so buoyancy will make a big difference when the battle ensues. A pontoon on each side attached to the body seems to do the trick. 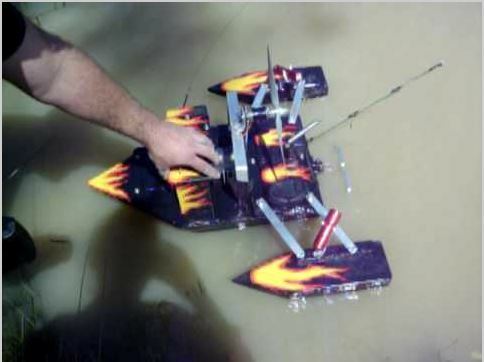 Pontoons would be easy to add to any rc boat with a simple glue gun and a couple of pop bottles, (I’ll have to try that), I remember seeing that once in a rc fishing video from 2012 featuring the Fish Fun Ed Hardy Rc Fishing Boat, and Carp Fishing. On closer inspection another feature is that his boat design incorporates what looks like a rc plane motor, giving the boat an aerodynamic feel, like a swamp boat. Why we waited so long to induct this guy into the Rc Fishing Hall of Fame I’m not sure! “What other feature’s do we see, oh”, a built in fishing rod. Not only a regular fishing pole to pull the fish in, Glen’s designed his to rell in the fish too. A small bell on the end of his Rc Fishing Pole alerts him that he has a fish onboard, and with the flick of a button on the remote the fun begins! A small motor reels in the fishing line to the rc boat, then the airplane motors engage and he navigates the fish to his location! 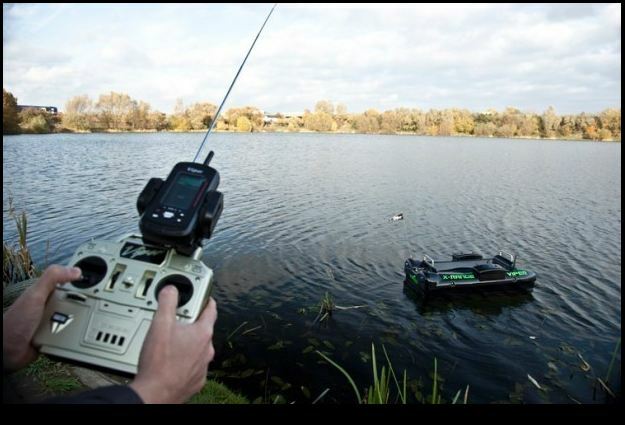 Here’s A Big Rc Fishing Shout Out To Glen2008! The Aussie Rc Fishing King!